The materials for manufacturing dust boots must comply to a number of conditions. 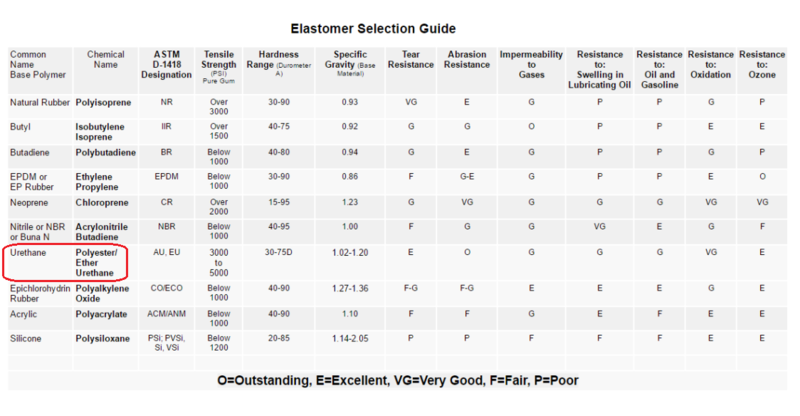 This chart illustrates the mechanical properties and resistances for some of the most used elastomers for dust boots against aggressive substances. For example the natural rubber is mechanically strong, but it is not oil resistant. The Acrylonitrile-Butadiene rubber and Silicone, are oil resistant, but they lack tear strength. Also the silicone has a low abrasion resistance. In fact many manufacturers and dealers offer dust boots made of Polysiloxane under the pretty name silicone. Silicone gaskets are not recommended to work in motion, because they show a low tensile strength and low tear and abrasion resistance. 1. The high tensile strength, a few times higher then other elastomers. 2. Excellent tear resistance, surpassing the Neoprene. A boot made of polyurethane would not tear, even in extreme conditions. 3. Impermeability to gases, a dust boot made of Polyurethane would not allow any gases or vapors, protecting the metal from corrosion. 4. Resistance to oils, gasoline and oxidation. 5. Excellent resistance to ozone, the main factor in aging in rubbers. 6. Outstanding abrasion resistance. In dust boots for ball joint and tie rod ends, due to the rotation of the swivel joint, the rubber boots would wear out and would compromise the sealing of the ball joint. All those qualities, combined with the right Shore Hardness and technology, make the polyurethane elastomers the best choice for dust boots.